The Chinese internet company Xiaomi was founded in 2010. In 2014 and 2015 it was amongst the top five (sometimes even top three) smartphone makers world wide. And with a valuation of over USD 46billion it is one of the world’s most valuable technology start-ups. Xiaomi might be known for its low-budget and stylish smartphones, targeting China’s middle class and its youth, but that is only part of what gave it that valuation. Investors believe that Xiaomi can build and ecosystem with its smartphones, smart home products and services consisting of games, apps and others. Its potential lies in bringing revenue through hardware-purchases as well as recurring purchases through services. Xiaomi’s portfolio represents that idea. Its offerings include a set-top box, rice cookers, a water and an air purifier, a drone, a fitness tracker,TVs, notebooks and a virtual reality headset as well as accessories such as power banks and audio devices. In China, Xiaomi’s market share in the smartphone sector fell almost 43% from Q3 2015 to Q3 2016 losing to its competitors Huawei, OPPO and vivo. In regards to that Xiaomi recently said that sinking smartphone sales do not affect the company that much because they care more about recurring revenue streams than one-time payments. In the same breath, Xiaomi highlighted its focus on smart home devices. In April, Liu De, Xiaomi’s Vice President stated that its smart home business is expected to double to 10 billion yuan ($1.5 billion) this year. That statement leaves it open to interpretation how the company sees the position of its smartphones in their overall strategy. Xiaomi wants to profit from its smartphone users through apps and other services. That is only possible if they ship smartphones is not happening. Moreover, the amount of smartphones introduced makes that statement even more confusing. (There are currently twelve smartphones in Xiaomoi’s portfolio and at least seven introduced in 2015 and 2016). With that in mind, lets look at what Xiaomi can do to solve its growth problem. Traditionally, Xiaomi has limited its distribution to online sales. However, tradition retail is still very important. When you look at the distribution of online and offline retail sales, this makes perfect sense. 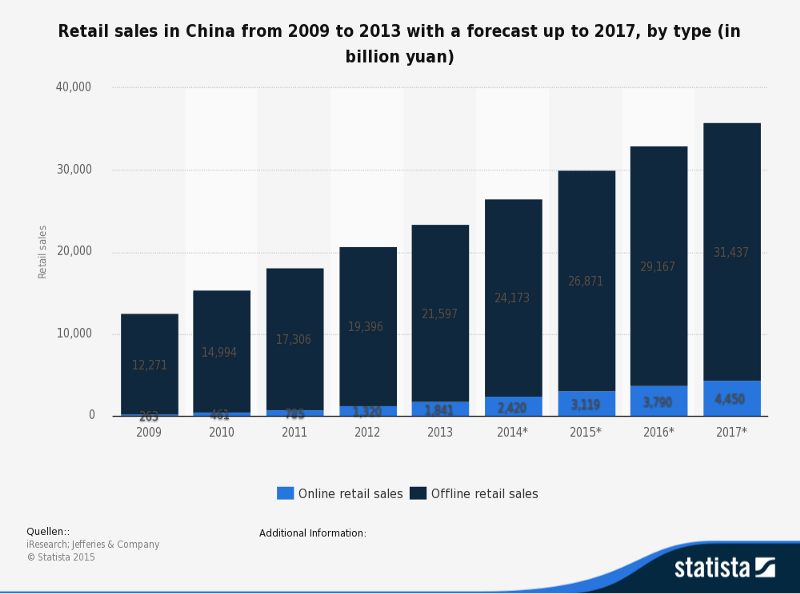 In 2013 online accounted for a mere 8% of total retail sales. Nevertheless, e-commerce is not to be disregarded fully, especially as online retail sales are predicted to grow about 20% annually over the next two years. 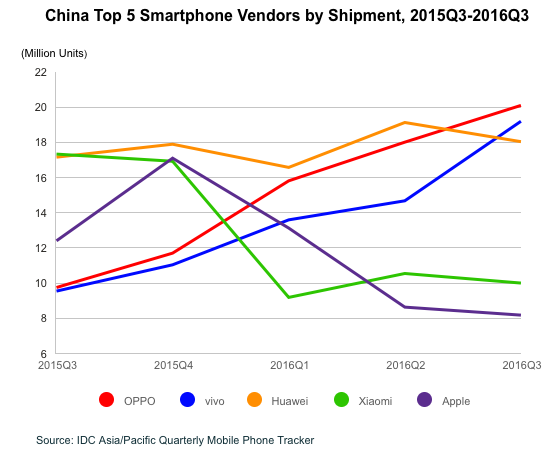 Because OPPO and vivo have invested in offline retail they were able to surpass Xiaomi. Xiaomi should serve its customers where they like to shop, which in this case is online as well as offline. Also, new product releases if they aim at a mass market, require people to test and see them. Your „average“ customer is unlikely to spend $600 on a phone she has not seen or tested before. Further, that give them opportunity for after-sales services (which has been a topic of complaint by its customers). In a study conducted this year, only 37% of Xiaomi owners reported that they would buy an Xiaomi phone again. As a reference, 74% of Apple users reported that they would buy an iPhone again. Further, Xiaomi users have stated its dislikes with the brand. In India, for example, customers reported„poor after-sales support, non-availability of spare parts“ and long repair times. Also, users of Mi phones reported cracked screens, issues with the headphones jack and overheating. Another sentiment that is hurting its brand is that people perceive it as „cheap iPhone copies“. With a strengthened brand and the right channels Xiaomi has to have the right products to deliver to the right customers. This is especially important in the smart home sector. A cracked screen is something customers can forgive, but a malfunctioning security camera will be far more harmful to their brand reputation. China has a market saturation of about 65% in total. Whereas 85% of 18–34-years-olds have a smartphone, only 43% of all 35+ have one. This gives us a potential market growth of about 320 million (280 million 35-years-olds and 50 million 18–34-years-olds). Calculation: Considering only the 35 to 64 years old to be buyers of smartphones, we get a total of about 570 Millions (of a total of 1332810869). Assuming 43% of that already covered, we get a potential market growth of about 280 million. (Assuming the population stays the same). The same principle applies to the other age group. Also, after initial decline in average selling per smartphone, Chinese have started spending more on their more on their smartphones. From 2010 to 2013 the average selling price’s (ASP) CAGR was about –11%, from 2013 to 2015 it rose on average 55% annually and was at $255 in 2015. This is still below the global ASP of about $300. 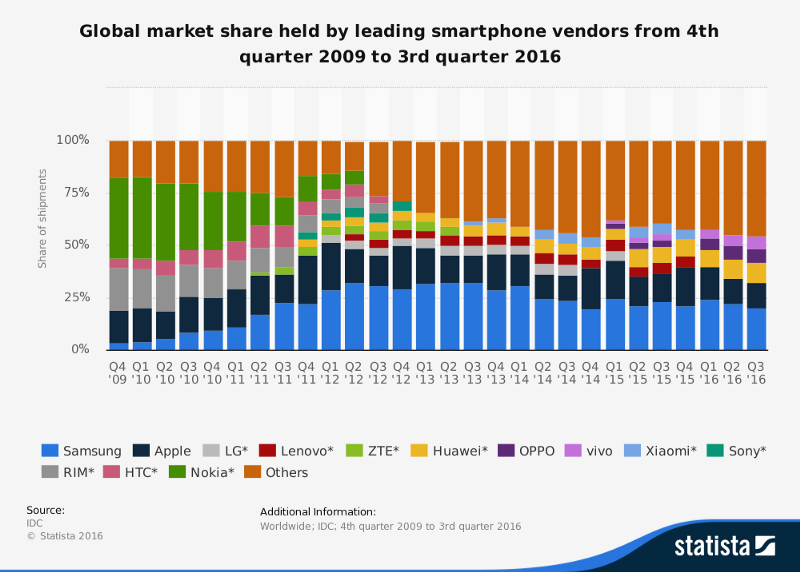 This becomes extremely interesting when you look at the ASPs of oppo, Huawei and Xiaomi. Xiamoi’s phones average at about $215, oppo’s at about $280 and Huawei’s at about $470. However, with its newly released, about $600 expenise Mi Note 2, is embarking into the premium segment. Nevertheless, even if Xiaomi makes premium-priced smartphones, they won’t be successful if customers do not trust the firm. 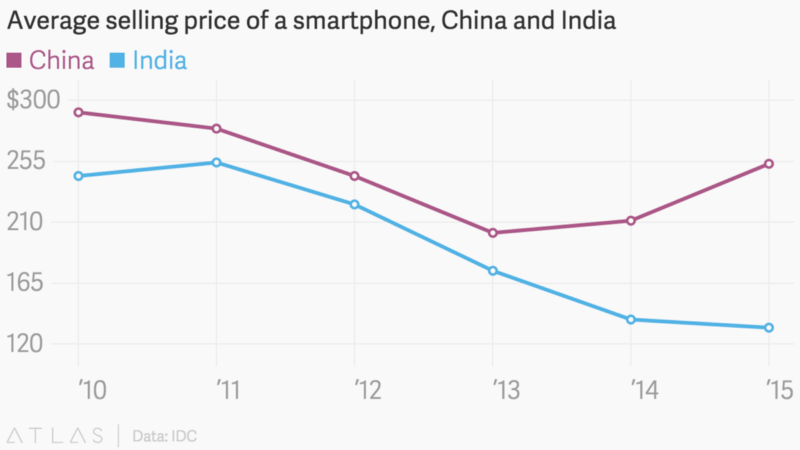 Xiaomi’s smartphone prices only cover its costs without margin. Also, these smartphones are high-end devices that compete with the high-end portfolio of its competitors.Considering financial resources needed to develop its retail activities, not raising prices is rather unrealistic. As a consequence, they would have to raise its prices to compensate for the costs of retail. Furthermore, first-time buyers are more and more delaying repurchases. However, if they repurchase, they not only tend to go for higher-priced smartphones but also to avoid Xiaomi due to its hurt brand. If Xiaomi wants to reach the 35+ years old flash might not work that well amongst the older generation. They have to switch to alternative ways of marketing. Xiaomi must not forget that also the Chines smartphone market will get saturated. Therefore, it has to look at several ways on how to „beat“ the product life cycle. One way is simply put innovation. One way for Xiaomi to boost sales is to introduce new smartphones with substantial innovation. 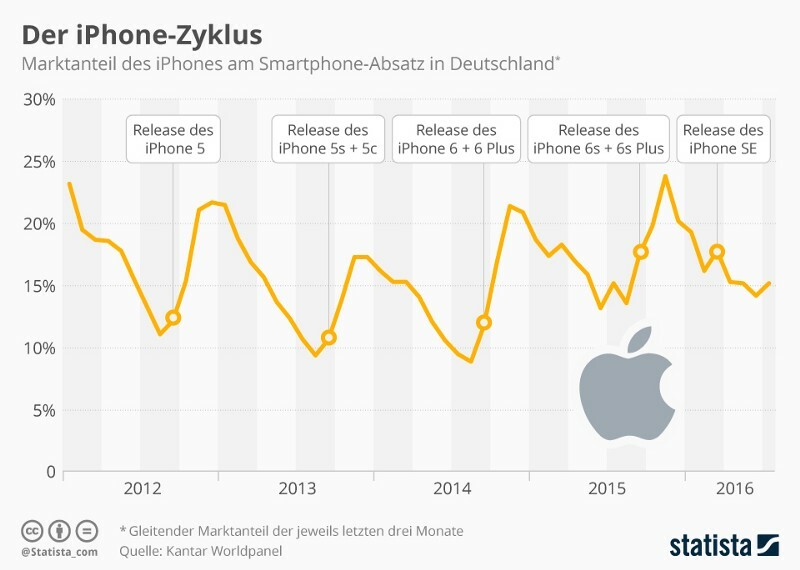 If you look at the chart of the iPhone’s market share and new iPhone releases you see that each new release ignited the market share. One way to do so is to focus on currently arising trends. Some of which Xiaomi could focus on are VR-ready smartphones and ubiquitous computing. Besides innovating the smartphone, there are several complementary products smartphones users are increasingly using with smartphones. These are devices such as wearables and smart home appliances. 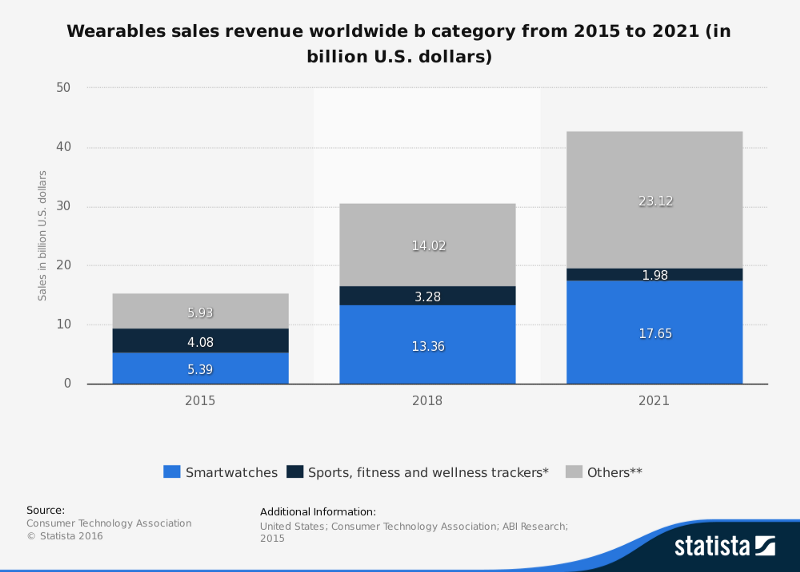 The wearables sales revenue is expected to grow about 20% annually. 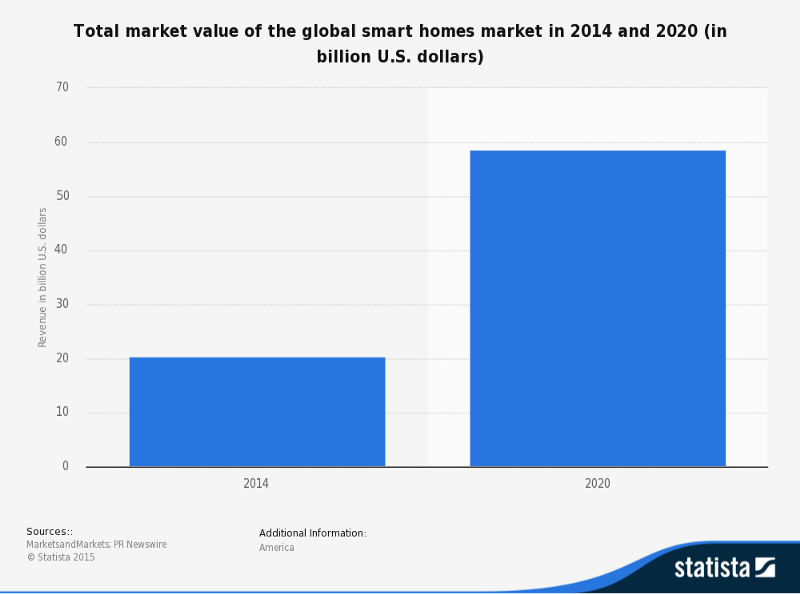 Similarly, the global smart homes market is expected to grow 20% annually. Another interesting category might be megatablets, especially as competitions is not that strong in that sector yet. Whichever product category Xiaomi chooses to focus on, they have to evaluate its potential in detail. They also have to do that with is current portfolio. Xiaomi wants to build an ecosystem and be present in your whole house. Whereas that might be a nice thought, I think it is unrealistic in the speed Xiaomi is trying to achieve it. Xiaomi has a very wide, but in some lines not very deep portfolio. They have twelve phones, but they also have one tablet, one notebook, four TVs, two sound systems, several smaller devices such as routers and set-top boxes a segway, a rice cooker one air and one water purifier and two types of security cameras. If you look at how the competition in each of these sectors is (take Samsung for TV, Netgear for routers, Apple for tablets, JBL for sound systems etc.) it is easy to see that they are fighting on a lot of fronts. Each of these products require heavy R&D costs which can only be compensate over time through economies of scale, learning and experience curves and other volume advantages, I strongly advice them to focus on a few promising categories. So fare I have only slightly touched internationalization (I quoted globales forecasts under “Boost sales through new product categories”). There are several things to consider when going international. I will elaborate on Xiaomi’s internationalization strategy in depth in a separate post, here I want to touch only on a few things. Xiaomi has started going global already, but it has and will further encounter several issues. Products have to be changed hardware- (charing adapters) as well as software-side (Xiaomi’s smartphones do not have Google’s Android appstore inside China). Further, they have to invest in IP rights to be allowed to license and sell outside China (the have encounter legal issues in that area already). Also, they are very little known outside Asia, therefore, they would have to invest in marketing (advertising as well es distribution).